If you’ve yet to experience the extraordinarily magical, dynamic duo that make up Aykanna, and you’re coming to Sat Nam Fest West this April in Joshua Tree, CA, you are in for a heart opening, joy amping, bliss inducing experience! And if you have experienced this wonder team, then you know what I’m talking about and you’re so stoked that you’ll be swimming in their nectar rich love vibe again so very soon! Sukhdev and Akahdahmah are pure radiance, they beam light and love in such a beautiful, expansive, heart centered way…and the music they create together… Totally and completely vibration raising! Aykanna takes us higher and higher! Our festival is the premier Kundalini Yoga and Sacred Chant Music Fest in the world…and the remarkably gifted and infinitely talented people that come together to co-create this experience are beyond magnificent! Aykanna, in ancient Aramaic translates as the pipeline between heaven and earth, and their music seeks to bring people closer to their divinity. Sukhdev and Akahdahmah passionately share a joint vision to express freedom, unity, peace, and love through their work with sacred music, quantum healing and Kundalini Yoga. Their love for one another, as well as our mother earth is infectious, and spreads through their music and teachings. And, if you haven’t yet, after you’re through reading, please head over to the Sat Nam Fest West website to register for the fest! You don’t want to miss it! What’s your most FAVE thing about Sat Nam Fest? Akah says it’s a sacred music family reunion! Agreed! Come on, soul brothers and sisters! And your FAVE Yogi Food? What’s your favorite Morning Sadhana practice? Forehead to the earth in deep prayers before the sun rises. Stretching, Sat Kriya, Kirtan Kriya, Sodarshan Kriya and Grace Of God Meditation. There is something very potent and magical about being up for sadhana, especially all together at Sat Nam Fest. The live music takes you into another realm. All I can say is I experience the group consciousness like home. It feels like I am exactly where I am suppose to be in that very moment. And to see all the bright smiles and faces after Sadhana bring me so much joy. We hug, drink tea and share stories about life. So rich! What’s playing on your music device right now? Please share a profound practice or music creation experience with us? I lead these groups every year in my local area of Topanga, CA called, “The Power Of A Woman”, and sometimes as a retreat as well. It’s a 6 week course and we meet once a week. We always take on a meditation for 40 days. ….the first night we chanted it, it was like a choir of angels. Something so profound happened in that moment for me, for all of us. I felt like all the women on the planet were chanting Adi Shakti and we were restoring peace by remembering our own very power. We are the Grace Of God. Absolutely some of the deepest connections to the chant that I have had. Best advice or insight for a new yogi? Akah: Appreciate everything about your life. What’s the most treasured spiritual inspiration book in your library? Would you be willing to give us a sneak peek at your creative process? Wow! So deep…and powerful! Thank you for your honesty in sharing such a personal truth with us. We’re all grateful for your process, for your healing… We receive your grace, the songs of your soul…and they take us higher… The creative tapestry of our lives continues to weave its wonders, heart to heart! When did you first start creating sacred chant music? During my teacher training at Yoga West, LA in 2005. Something just inspired me so deeply. What do you love most about your Kundalini Yoga practice? 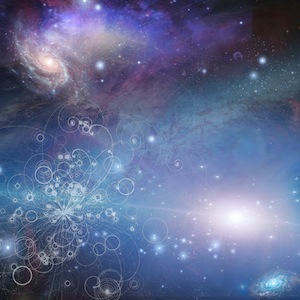 I get so energized and I connect to my own infinity. The rest quietens and I am resting in my heart. What’s new and up and coming for you? We are heading into the new album now….we want to keep it hush hush as we are downloading the concept right now. Getting it all together. It’s interesting I always have my ideas or Akah has his about what we should do next and then one or both of us gets a massive download from the Universe that you just can’t ignore. Feels so much better when it comes from an intuitive place rather than a maybe formulated idea…. Absolutely!! …and we can’t wait to hear the fruits of this next co-creation!! Well, we *can* wait; it will be an eager wait! Take your time…let it flow in…in grace! Is there anything else you’d love all future Sat Nam Fest’ers to know?! This could be a new thing for you to explore…this year 2015 is about doing new things! And, it may introduce you to a whole new community you may have been longing to be a part of and did not even know it. We started out talking about your favorite thing about Sat Nam Fest and Akahdahmah responded that it’s like a Sacred Music Family Reunion… And now, you’re offering the idea that we’re being called to enter into community with those that gather for Sat Nam Fest…something we’ve all perhaps felt a longing toward. That’s it, isn’t it? It’s about connection. Recognizing ourselves in each other. This festival calls us together, uniting us in love, light and devotion… Opening our hearts, filling our souls with bliss, expanding our consciousness. Together, we chant, sing, dance, elevate…celebrate! We are so blessed by you both, dear Sukhdev and Akahdahmah! 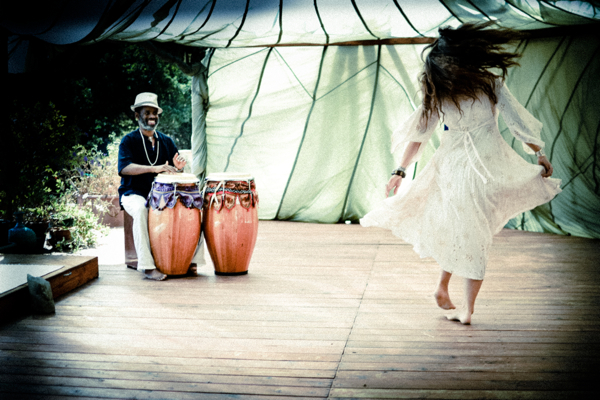 We are blessed by the sacred music you create together as Aykanna. Keep shining that radiant LIGHT of yours…and we’ll see you both at Sat Nam Fest West! Aykanna will be in concert at Sat Nam Fest West on Saturday, April 11. 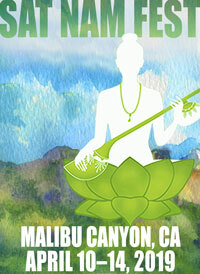 Aykanna live music during yoga with Krishna Kaur on Thursday, April 9. REGISTER NOW to Experience Aykanna! …and all of the other amazing artists and teachers collaborating to make this year’s Sat Nam Fest West the most amazing one yet! Their powerful synergy captivates and inspires the listener with a soulful, rhythmic blend of inspirational wisdom and sacred devotional music. In ancient Aramaic text Aykanna translates as the pipeline between heaven and earth, and their music seeks to bring people closer to their divinity. Sukhdev’s earthy, soulful voice, and deeply soothing presence, paired with Akahdahmah’s entrancing shamanic­ percussion, creates an ethereal musical paradise. Aykanna has released four inspirational albums entitled: Livelight, Mother, Mantra Mala and their current release “ Seeds Of Love”. Sukhdev was birth named Pauline Drossart in Brussels, Belgium and moved to London when she was 11 years old. After the loss of her mother at the age of 7, an uplifting musical movement in West London fostered Sukhdev Jackson in her early childhood. Curious to discover the music her mother loved, Sukhdev began to collect vinyl records shortly after her mother’s passing. Music legends such as Nina Simone, Billie Holiday, Aretha Franklin, Stevie Wonder, and Earth Wind and Fire sparked beautiful memories and inspired her young spirit. By the age of 18 her talents had naturally progressed and Jackson landed an EMI record deal with Parlophone Records – the label The Beatles were signed to. She was in a musical category of her own in the mid 1990’s, with a unique poetic fusion of French and English Hip Hop and RnB. She toured the world, appeared on MTV, and was recognized for her unique style by Billboard Magazine. As part of the urban sound of London, she thrived in the creativity and dynamism of rap music, but a chaotic industry devoid of spirituality left her empty and searching for something more. Sukhdev discovered Kundalini Yoga and meditation upon moving to Los Angeles in the year 2000. After a decade of battling drug addiction, she experienced the healing power of meditation, yoga, and prayer, which changed her life dramatically. Her newfound spiritual path led her to becoming a certified Kundalini Yoga and Meditation teacher in 2006, when she was also was given the spiritual name Sukhdev – which means the angel of peace. For the past ten years she has had the privilege to study extensively with Yogis, Holistic practitioners, Shamans and the Native people of the Chumash tribe. Upon finding her life’s purpose, Sukhdev attracted her soul mate and now life partner, Grammy nominated percussionist (with India Arie), and Kundalini Yoga teacher, Akahdahmah. A 5th generation plant and spirit medicine man, inheriting this legacy from his Great, Great Aunt Mamie, a pinewoods plant and spirit medicine woman from Alabama, Akahdahmah uses drumming as “medicine music” for humanity. He explains, “With every beat of my drum, I intend to transmute the pain of the heart into the joy of the soul.” In 1985 he left his premedical studies in New York to discover the true power of our bodies function and its ability to heal. He was especially motivated to restore balance to his aching heart. Akahdahmah journeyed to California where he was introduced to the healing effect of drum meditation and indigenous ceremonies. This led him, in 1994, to study with Max Borisoff a retired Orthopedic Assistant, Digestive Physiology Researcher and founder of the Healing Ministry in Los Angeles, California. Akahdahmah went on to complete a 6-year training in Herbal Formulation and Holistic Counseling, and was ordained as a Healing Minister in 2000. He is currently training in Medical Qigong. As a husband and wife team, Aykanna has toured and taught all over the world including: Central America, United Kingdom, Belgium, France and Switzerland. Aykanna has performed for thousands at Yoga Festivals and other conscious gatherings including: Sat Nam Fest, Wanderlust, Hanuman Festival, Yoga Journal Conference and the Summer Solstice Sadhana Celebration. Sukhdev and Akahdahmah offer a joyous approach to yogic teachings rooted in love and faith. 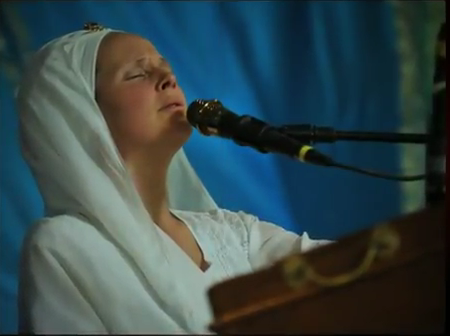 Aykanna’s music is positive and inviting, reaching out beyond the boundaries of Kirtan and New Age music genres and into the hearts of all people. Register for Sat Nam Fest West by March 15th and Save!